Pheromones are sexual-attractants which are excreted by all insects and animals – even humans – to attract the other gender. A large part of the sexual behavior of insects and animals is controlled by pheromones, which can be perceived by the own sensory organ in the nose called vomeronasal organ (VNO). They are invisible, odourless and therefore appeal subconsciously. 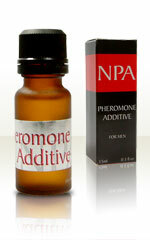 The word pheromone is derived from the Greek and means 'Carrier of arousal'. Farmers have been using pheromones for years to encourage cows and bulls to couple. 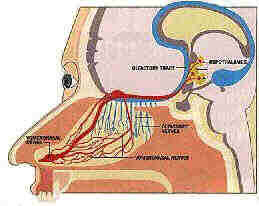 Already smallest amouts induce a stimulation in the brain via the VNO within a fraction of a second. The use of antiperspirants and the pill seem to interfere with our normal pheromonal functions. Pheromone products are ideally applied to natural fibres including paper. That doesn't mean that you cannot use them on your body. It simply means that they won't last that long if you apply them to your body. Pheromones applied to your body will be attacked by bacteria the same way sweat is. Spraying once on a paper can last for a 100 days. On natural fibres pheromones can only be removed by dry cleaning. They are not soluble in water. For using them on your clothing three to five sprays are sufficient and are ideally applied on the collar, sleeves, ties etc. One of your customers sprays his entire wardrobe with the pheromones and closes the door tightly then – a very efficient method. The effect a frangrance has on us varies by the way it is presented to us. If you were lost, cold, wet and hungry, straying in a forest, the odour of burning wood would be very appealing. You would move towards the origin of the smell and hope for warmth, maybe even nourishment. However, during a theatre production the same smell would very likely induce a panic amongst the audience. If a sensitive, caring man carries the smell of a 'territory keeper' along with his lovability, women tend to find him even more attractive. Subconsciously the message delivered is: This man can procreate strong descendants, take care of the growing family and protect it. It is just the same in the animal world where a partner is chosen because of his strength and vitality. An innately aggressive and threatening character will appear even more intimidating if his words are enforced by this smell. Competitors cautioning customers because of alleged ineffectiveness of our products have no basis in fact. All manufactures known to us exclusively use synthetic (affordable!) human pheromones which were identified in the picogramm area of the human sweat. Competitors often advertise for allegedly superior 'synthetic human pheromones' (who doesn't use them?) with two patents. The effect of his Eau de Toilette is not aiming for the opposite gender though, but the own mood. It is supposed to induce a condition close to intoxication where the carrier himself feels elated and sensuous, so to say to carry him into another 'realm'. We have to leave it to our customers to decide which strategy is more likely to awake the subconscious mating instinct of women: The impression of an actually disinhibited, only conditionally sane fellow or the subtile, subconscious signals of strength and dominance as well as fertility.